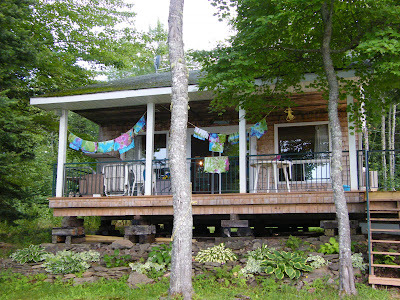 Imagine... a lake.... a cottage... a wraparound deck with part shaded and part sunny... for all your relaxing pleasure. Imagine sunshine, warm breezes, yellow Adirondack chairs and a cool drink. 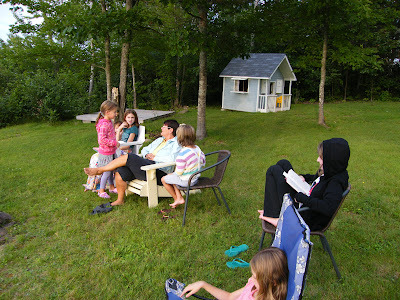 That was my week last week at my sister's first annual "Grammie Camp". A little history.... My sister and her hubby have been blessed with 6 wonderful grandchildren. 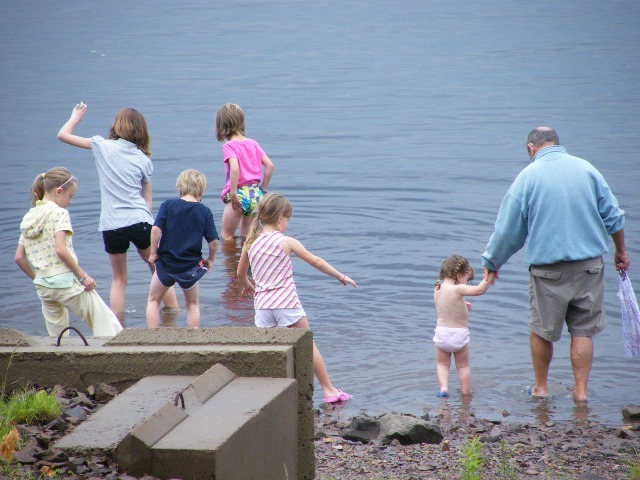 At the time of Grammie camp they are aged 11, 9, 8,8,8 and 2.5! I have been extremely blessed to be a part of their lives as "Auntie Donna". 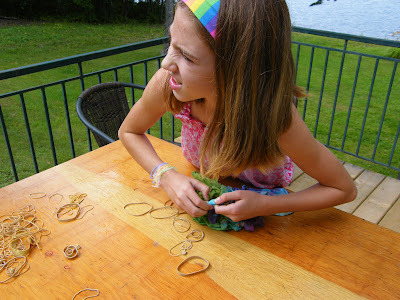 Sometime this winter, my sister came up with the idea of having a summer camp at the cottage for her grandkids, and do fun stuff like crafts and games. We talked about it over MSN while she basked in the sun in South Carolina... and I shivered here in the snow. 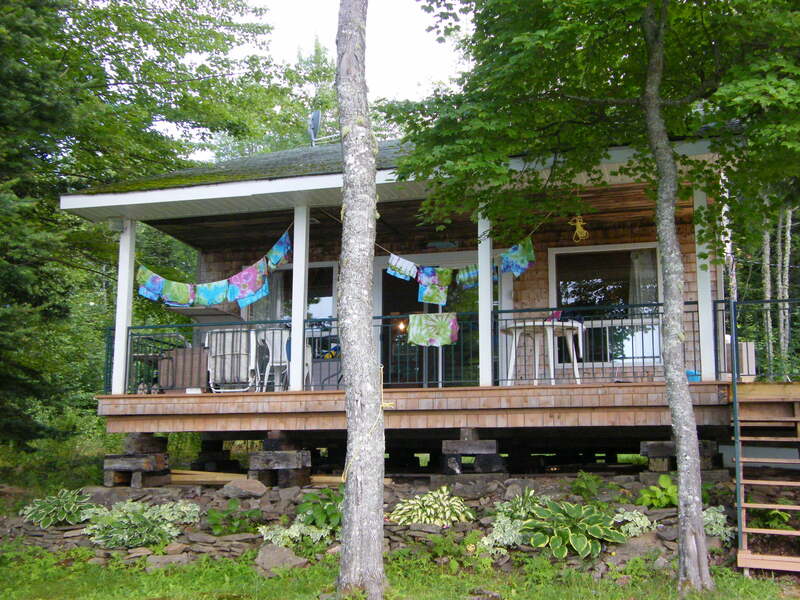 The thoughts of the warm breezes of the cottage just warmed my bones and the thought of being surrounded by those kids, there... excited me for such an event. Now, Mitchell, the only grandson in the pack, chose not to go to camp. He felt it would be too girly. Grammie let him in on all kinds of secrets (of what we were planning, to reassure him it wouldn't "be "girly") but he stood his ground. No Grammie Camp for him. Because we were down one participant. I invited my 14 year old niece Caleigh to come along and be a help and a surprise guest! 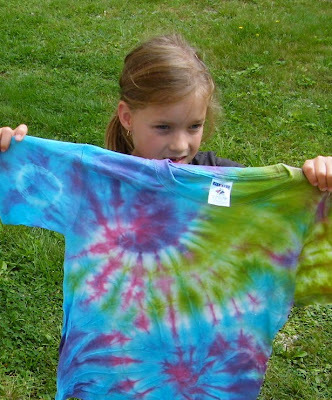 I know I painted a relaxing picture in my first paragraph... and we did have all that... but dispersed in amongst that was....... tie dying shirts, paper mache, string art, balloon art, flower pens, treasure hunt, scavenger hunt, spa night, movie night, campfires (with smores of course)! 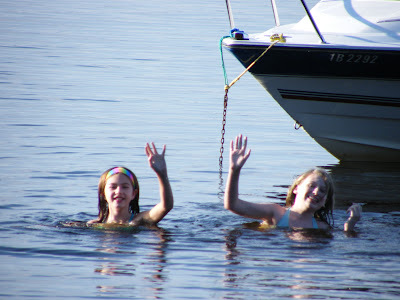 Not to mention fun camp food, water balloon fights, and playing in the lake! On each of the 4 days of camp we wrote a schedule on the chalk board by the bathroom. The kids loved knowing what was in store for the day, but we didn't let them know any more than that day. So, on top of knowing what was happening, they were excited to anticipate what was going to happen the next day!!! After the kids unpacked and had a fun lunch (and said good bye to the parents), we got right to our schedule.... 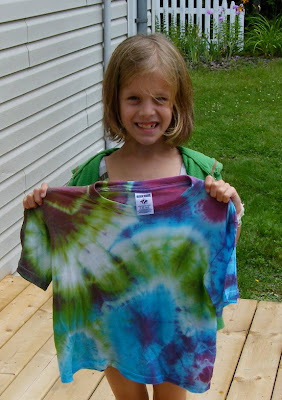 Tie Dye our camp shirts... Gail and I came up with three techniques that the girls could chose from. Some chose one technique, and others chose all three... Not one of our shirts was the same as the other.... it was a blast! Once the shirts had soaked in many colors of dye, left to dry for a couple of hours.. we unwrapped them to discover their design secrets. 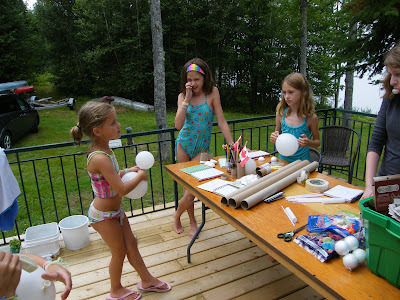 While waiting for the shirts to dry, we started to talk about and design our Paper Mache projects. I have paper mached about 5 things in my life.... a snake, a pig, a giraffe... a fish.... ugh.. I don't remember... but I didn't feel that confident when it came to making all sorts of animals. 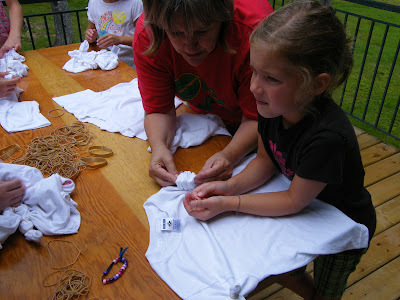 But I didn't want to limit the kids either, so I was going to help them with the creation part, as much as I could. .. It didn't take long for them to decide what to make... A pig, a fish, a cat, a whale and an elephant! 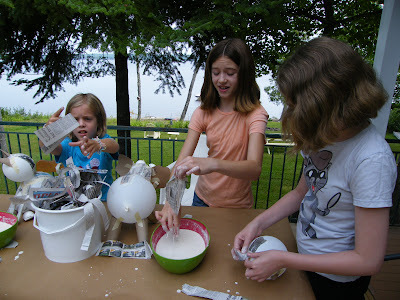 I sort of know the concept of how to make things from balloons, tape, newspaper, etc and it didn't take much to get them going on the right track. 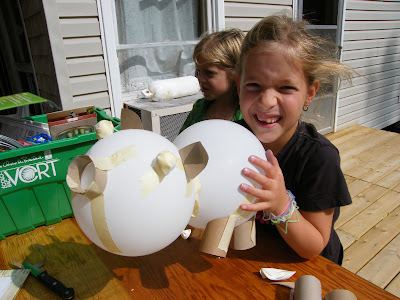 The kids started by drawing what they wanted to make... and then we began. What a blast... we taped on legs, feet, tails... ears.. noses... and giggled and laughed about how funny they looked. 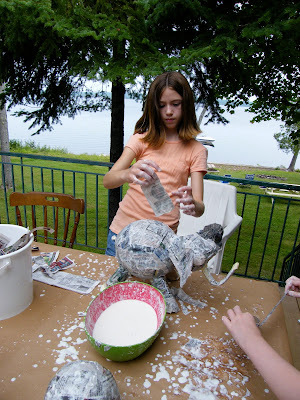 Our paper mache project was going to last for 3 days. Construction on the first day... papering on the second day and painting on the third day... Below are just a few of the fun pictures of the actually constructing and papering. 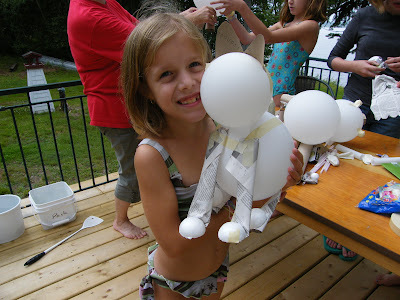 Aurora made her own fun with the balloons, since she wasn't really invited to make an animal! 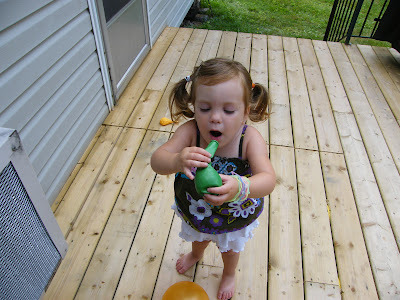 Its amazing how much fun a balloon can be!!!! 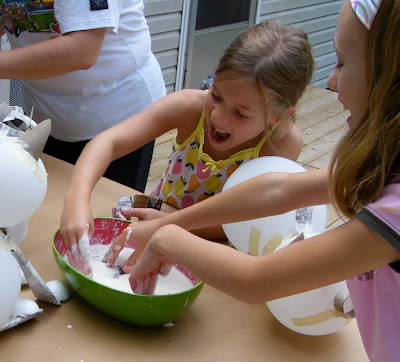 After the first layer was put all over each animal.. the kids helped me put on a batch of old fashion ice cream. Flavor of the day... Oreo cookie Vanilla!!! While that churned away in its bucket, the kids made a bee line for the lake..
We had a very hot and very big camp fire after supper and evening play... and when we all went to bed later in the night, it was pretty darn easy to fall asleep... we had a very full day and it only started at noon!!! 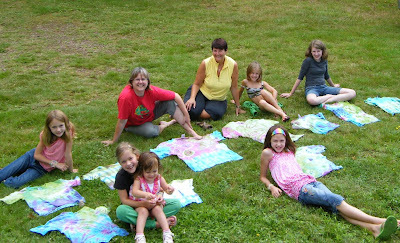 Grammie Camp sounds like it was a blast! You and Gail are an amazing team...those kids are all very lucky to have you in their lives! It just warms my heart to see the kids have so much fun. I am so lucky because they are great kids who love to do crafty stuff. They really love you too Auntie Donna. I had a conversation recently with them about how smart you are and they thought that you were pretty too. So the pretty pills are doing a good job. Look who is living in my pond! Grammie Camp... the Last Day!